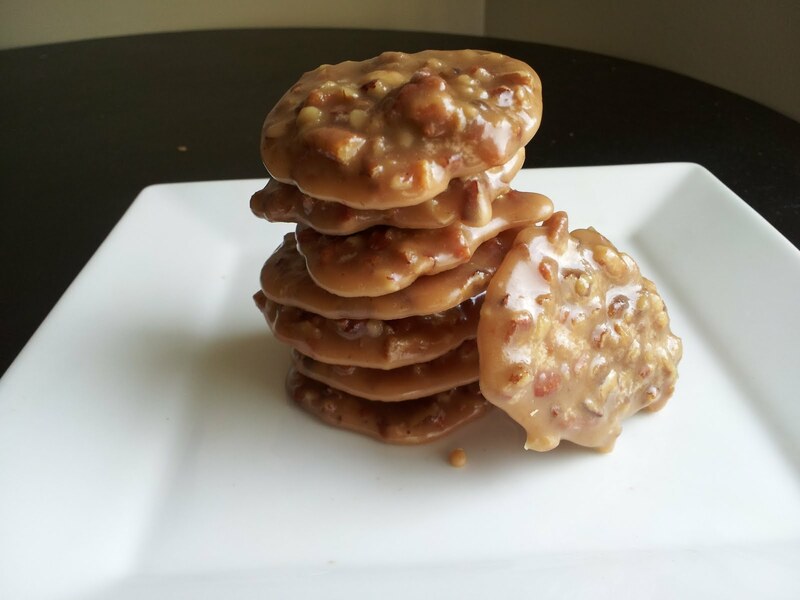 When I was in New Orleans, I left no praline untasted. I loved the sweet flavor of the cooked sugar paired with the crunch and earthy flavor of pecans. While on vacation, I made a mental note to try this one at home. Today was kind of a slow day after I went to yoga and finished my errands, so I decided to take a whirl at this whole praline business. This would have been much easier if I had a candy thermometer, but instead, I made do with a meat thermometer. Regardless, I went from picking out ingredients to eating in about 20 minutes. But, this recipe requires a specific temperature, so it requires your undivided attention. I'm not sure if this is very authentic, but my husband loved these pralines, so I'm taking that as a ringing endorsement. Lay out a large piece of parchment paper on your counter. Combine the sugars and evaporate milk in a saucepan, then place over high heat and bring to a boil. Next, add the remaining ingredients and stir to combine. Cook until the mixture reaches 234 degrees, then stir once and remove from the heat. Let the combination cool for five minutes. Using a wooden spoon or whisk, beat vigorously for one minute to thicken. I used a small scoop to divide this into equal portions, but it's just as easy to spoon this onto the parchment paper. Let it cool completely, about 10 minutes, if you can wait that long.